Scotty (Tom “Billy Jack” Laughlin) is having a bad day. First his mother (Lotus Corelli) is worrying too much about some local hoodlums messing with him, and tries to prevent him from going out on a date with his girlfriend Janice (Rosemary Howard). When he finally gets to Janice’s house, he’s met by her parents, including her irate father, who thinks she’s too young for Scotty’s intentions and forbids them from seeing each other anymore. 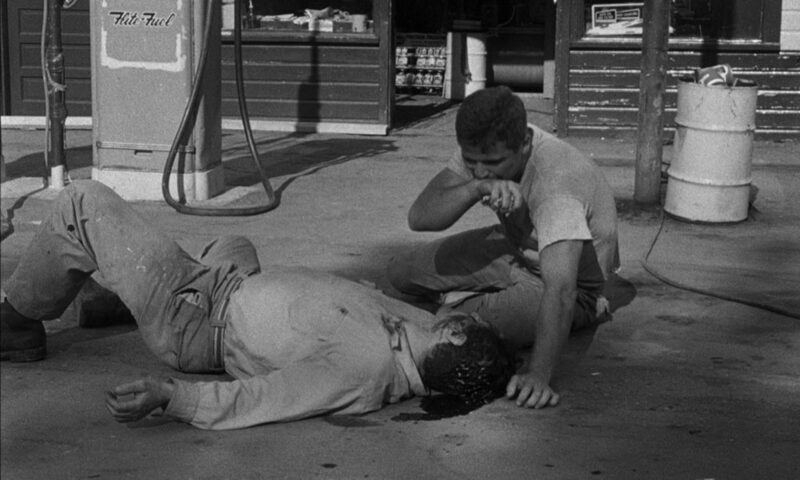 Dejected, Scotty goes to a local drive-in, where those local hoodlums, lead by the 18-going-on-40 Cholly (Peter Miller), slash the tires on a rival gang’s car but make it look like Scotty did it. Jumped by a bunch of angry guys, Scotty holds his own, taking out his bad day on the face of one poor chump. Cholly senses Scotty would be good for some shenanigans, though his sidekick Eddy (Richard Bakalyan) doesn’t like the do-gooder Scotty, and makes this well known. Soon Cholly has concocted a nasty scheme that he says will bring Scotty and Janice back together, but which is really meant to harass Scotty, just for fun. 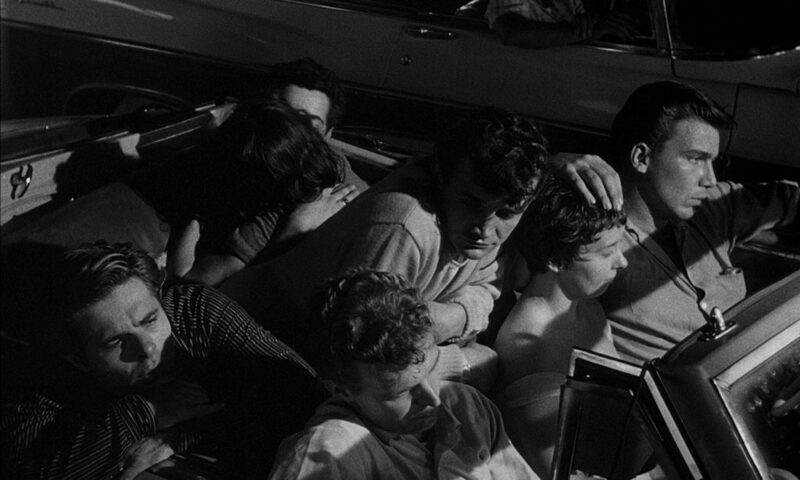 Written and directed by Robert Altman, who up until then had only directed corporate and educational films in his home town of Kansas City, The Delinquents was the brainchild of a local businessman looking to create drive-in movie fodder for his own theaters. What sets The Delinquents apart from other low-budget teen flicks of the time is its professional look. It’s clean, even sleek, and without the (usually hilarious) errors one would find in something meant to basically be background noise while teenagers necked in the back seat. The film goes even further by refusing to paint the parents as one-dimensional monsters like so many other teen movies did at the time. Instead, they’re all trying to do the right thing, but they’re misguided and maybe old-fashioned. Janice’s dad for instance is concerned because his 16-year-old daughter is already talking about having kids with her boyfriend, and he thinks she needs to see other people while she’s young. He also doesn’t think Scotty is as interested in her as he should be, and Scotty proves him right by believing Janice is 17, even after he’s been corrected. Scotty’s parents are somewhat better, though still flawed. His mother, played by Altman’s then-wife Lotus Corelli, is concerned that the bad kids in the neighborhood would influence her son, but her husband doesn’t care about anything except that she’s talking so loud he can’t hear the TV. Lotus didn’t do much acting but she does well in her role. She was pregnant during filming of The Delinquents, and had to endure the fun of her husband sleeping with another actress, Helen Hawley, who played Janice’s mother. Lotus’s and Robert’s son was born in 1955, and Altman clearly had no idea how to raise him, even though this wasn’t his first child; his daughter Christine, about 8 years old at the time, plays Scotty’s sister. Lotus relates a story in Robert Altman: The Oral Biography about a time when she came home from work to find their toddler with his head stuck between the bars of the crib, and Altman laying on the couch, doing nothing, apparently clueless as to why this would even be a problem. Scotty’s parents in The Delinquents are basically a version of Lotus and Robert, intentionally or not: the dad is a chubby, lazy man who doesn’t want to parent, and the mother, well-meaning but overly concerned, is played by Lotus. Other actors came from the Calvin Company, a Kansas City production studio that Altman worked at off and on for years. The three leads, however, came from California after Altman made a scouting trip looking for actors, and he managed to score some pretty experienced guys, considering the low budget. Laughlin and Miller had been in Tea and Sympathy as well as several television shows, though Miller also appeared in The Blackboard Jungle, Forbidden Planet and Rebel Without a Cause. Bakalyan had fewer roles before being cast in Delinquents, but he made quite a career for himself playing a rough kid; his next film would be Jerry Lewis’s The Delicate Delinquent. And it’s surprising how many people confuse promotional photos for The Delicate Delinquent with this film — even this Kansas City magazine article about KCMO locations used in movies uses a picture with Jerry Lewis in it, instead of a picture from The Delinquents! 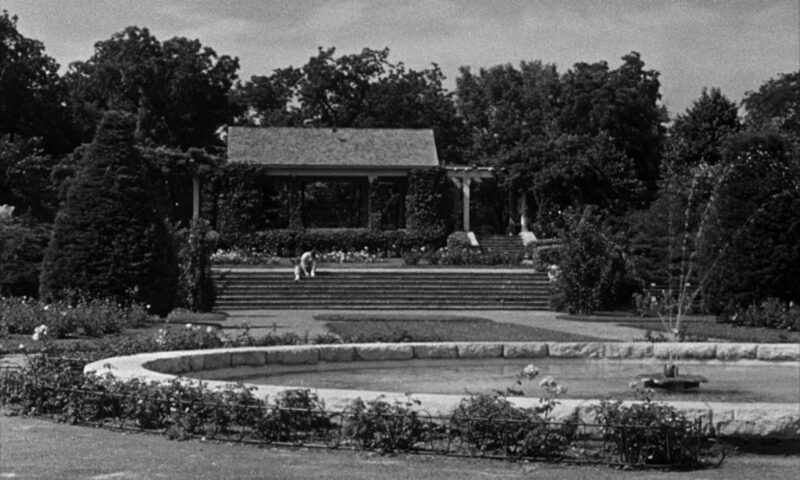 Speaking of filming locations, Kansas City locals will recognize several sites used in the film. It opens in a local jazz club, the name of which I haven’t been able to find, but which featured well-known Missouri jazz singer Julia Lee. 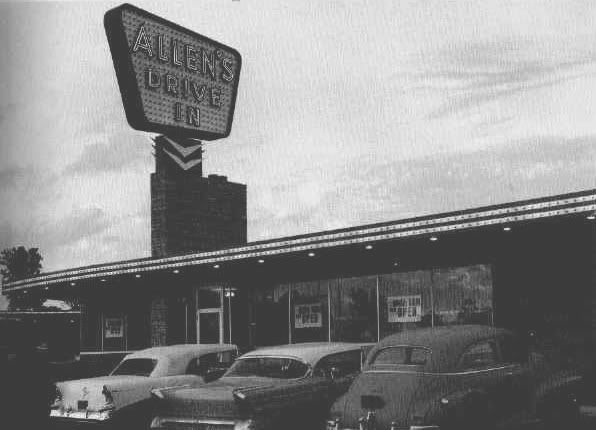 The now-demolished Crest Drive-In movie theater plays a big role, as does the police station on Locust Street (still there in all its boxy 1930s art deco glory), the rose garden in Loose Park, and Allen’s Drive-In, though don’t ask me which location it was. Olive Films has released The Delinquents for the first time on Blu-ray in a gorgeous print. It’s pretty bare-bones, but has good subtitles along with good audio. This is a film that cries out for a commentary track, and the lack of one is the only nit I would dare to pick about this release.